Some of the most beautiful places in Switzerland lay far from the beaten track and are some of the least touristic places to visit in Europe. This is what makes Switzerland all the more special to visit as you will find yourself in a truly genuine and authentic land, filled with wonderfully hospitable people and wanderlust inspiring landscapes to match. The mountainous nation of Switzerland is famed for great skiing and snow sports, although landlocked you can still get your fix of what feels like a sea breeze from the many vast expansive lakes that Switzerland has on offer, most iconically Lake Geneva. The Swiss Alps are one of the most beautiful places to visit in Switzerland, in Europe, in fact the world. As bright blue cloudless skies hang over the glaciers and peaks the snow capped mountains glisten in the sunshine offering breathtaking views and unrivalled beauty. 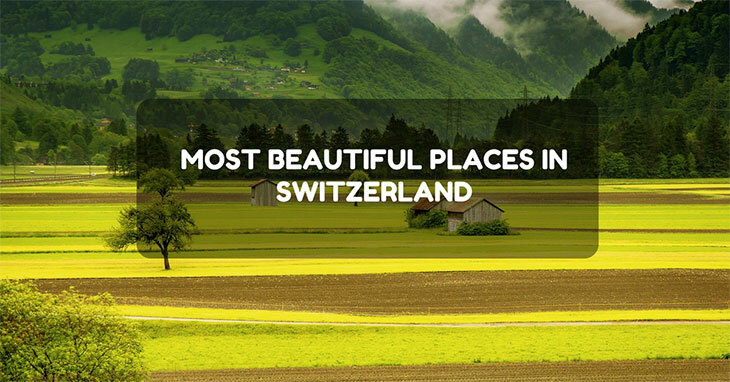 Although Switzerland has a myriad of beautiful places to visit that would take a lifetime to explore in their entirety we have found the 7 most beautiful places in Switzerland for you to visit on your next trip. Pack your sense of adventure and a warm jacket as you start your adventure of the Alps! Lake Geneva, known locally as Lac Léman, is one of the most breathtaking places on the continent. The arc shaped lake is crosses the border of Switzerland and France and is overlooked by the towering Alps above. Lake Geneva is land locked Switzerland’s largest body of water and the peace and tranquil that this fresh water glacial lake brings is second to none. It is a popular choice for many travellers to hire a small rowing boat and explore the lake at their own pace. This is a wonderful way to be at one with nature and take in the wonderful scenery. 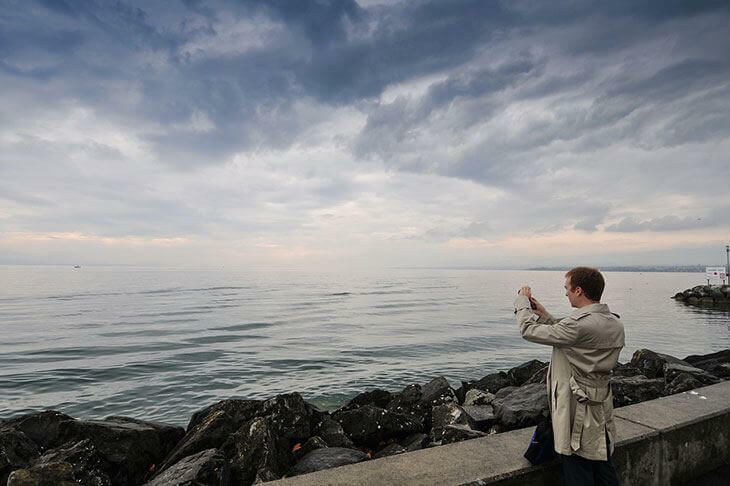 Acting like a giant, glistening mirror to the great Alps above Lake Geneva is a wonderful place to put your photography skills to good use and capture the iconic landscape for yourself to frame upon your wall forever! Accommodation around Lake Geneva can be quite expensive but with views that spectacular it is well worth the price tag! 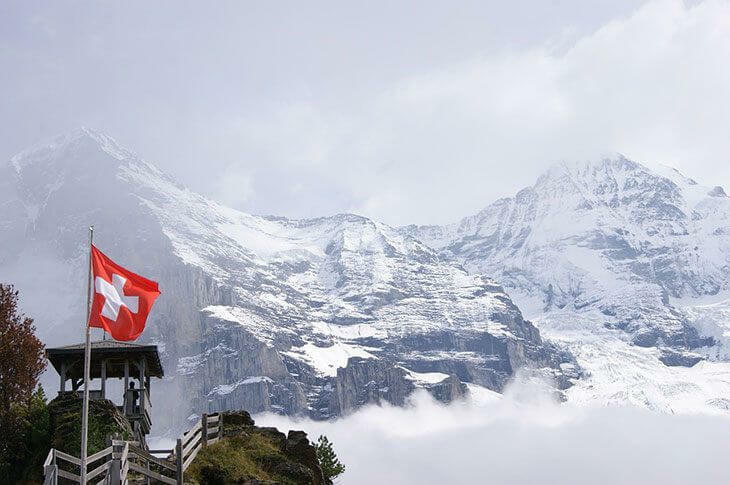 The Jungfraujoch is one of the highest peaks in Europe and is affectionally referred to as the Saddle of Switzerland as the Jungfraujoch connects the magnificent Jungfrau and Mönch mountain peaks. Jungfraujoch makes a great day trip from the Swiss capital of Berne but is equally accessible from Interlaken and Lucerne too. With icy winds blowing in your face and the snow capped floor below look out over Mittelland and onwards towards the Vosges. From your first steps out on Jungfraujoch to your last as the sun goes would you will feel as if you have stepped into another world, a winter wonderland if you will. The highland of any trip to Jungfraujoch is of course Eismeer, the sea of ice. This 3160m high station offers views of the bluish ice blocks and frozen sea below. The panoramic views of the Alps fro the Eismeer station are mind-blowing! The truly charming 16th Century Chillion Castle is one of Switzerland's most beautiful landmarks set in one of Switzerland's most beautiful landscapes of Lake Geneva. On the shores of the great Swiss lake the medieval fortress of Chilean Castle stands proud and astute against the sparkling blue backdrop. Chillon Castle is Switzerland's most visited landmark and with good reason the fortress, built in 1536 has guarded over the lake for over 260 years. 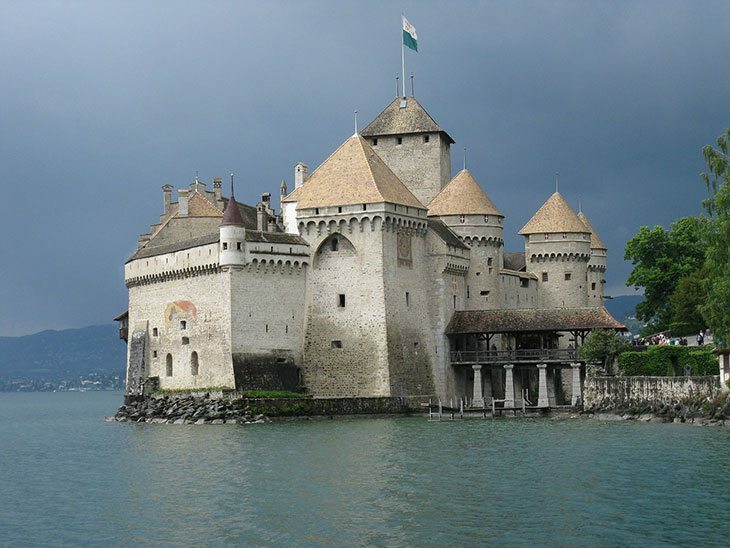 As one of Switzerland's most iconic landmarks Chillion Castle is a must visit for anyone who adds a trip to Lake Geneva to their itinerary. Magnificent and truly enchanting the magical Chateaux can be accessed by walking from Montreux or from Villeneuve. Many chose to start their explorations in Montreux and exit towards Villeneuve. If you’re able, hang around the lake at sunset as as the sun drops below the horizon and skies turn hues of red and orange Chillon Castle is illuminated and looks even more wondrous. 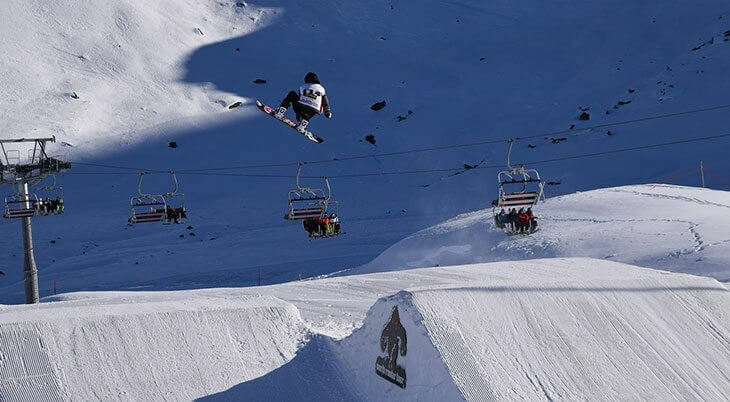 St Moritz has been the go to location in Switzerland for the great and the good for decades to push themselves to the absolute limits and take part in the crazy Cresta Run. The luxurious town of St Moritz is a wonderful place to explore and holiday. With beautiful views of the Piz Corvatsch St Moritz has a whole host of activities on offer to keep you on your toes during your stay. Get your skates on at Lake St Moritz and try your hand at ice skating over the frozen waters. St Moritz has hosted the Winter Olympics twice, will your ice skating skills be up to scratch?! In the summer months St Moritz is a popular destination for hiking and mountain biking. If the weather is right it is possible to windsurf on Lake St Moritz too! St Moritz is not only one of the most beautiful places in Switzerland but probably the most fun too! Lucerne is picture perfect Switzerland at its best and it certainly one of the most beautiful places in the country. This compact Swiss city is home to just under 400,00 people who welcome visitors and tourists to their lovely little city with open arms. Lucerne has preserved its medieval heritages most specularly, the ancient architecture is still in wonderful condition and adds to the historical and rustic feel to the city. 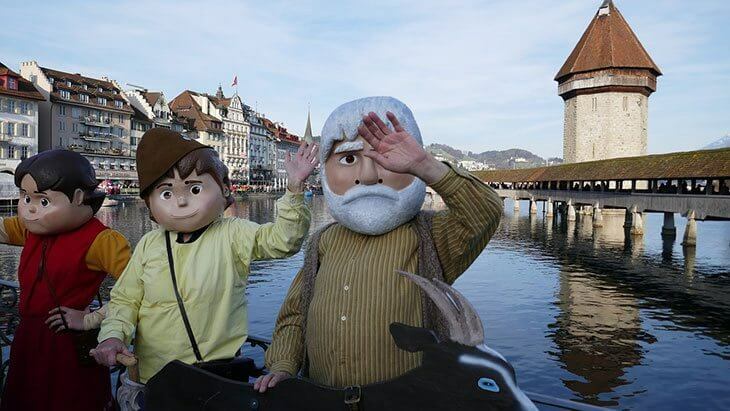 With old architecture coupled with awe-inspiring panoramic mountainous landscapes Lucerne. With a lake, wonderful heritage to explore and the mountains too Lucerne’s diversity is what makes it such a special and popular destination. Lucerne is a great central location to base yourself for further exploration of the great Swiss lands. With a range of hotels from big and luxurious to small and boutique Lucerne has a hotel or guesthouse to suit every budget. Lake Lugano is one of Switzerland’s best kept secretes and a fantastic hidden gem. Nestled in the Swiss Mediterranean region Lake Lugano lies on the south side of the Alps in Ticino. You will feel like you have left Switzerland and stepped into idyllic Italy when you visit Lake Lugano. Scattered around the small Swiss town are palm trees and citrus fruit plants giving the city of Bellinzona a wonderful vibrant and zesty scent that hangs in the air all day long. The Lake Lugano region is Swizterland’s only Italian speaking canton and within the walls and ramparts of Bellinzona’s three stately castles you should try your hand at the language of love! This glacial lake is named after Lugano City and is nestled between Lake Como and Lake Maggiore in the heart of Europe. Basal is widely regarded at the artistic capital of Switzerland. Close to the German and French borders Basal has medieval ramparts and old town market place that is a wonderful location for dining of an summer’s eve. As Switzerland's second largest city Basal has plenty of cultural attractions in store for you. The Old Town is one of the most beautiful spots in Switzerland and as you wander the cobbled streets you will feel as if you have stepped back in time! You certainly can’t miss Basler Münster, the tallest spire town in the city and the decadent tiled roof can been seen fro many spots throughout the city. Rebuilt in Gothic architectural style after the earthquake hit in 1356, Basler Münster is a beautiful Roman Fort well worth a visit. We have collated just seven of the most beautiful places in Switzerland; this great land locked nation has countless snow capped mountains, icy glaciers and placid lakes to explore! One thing is for sure, wherever you go in Switzerland you will be greeted by breathtaking landscapes and views that are too beautiful to be captured on camera!